Amino acids are compounds whose molecules encompass amine group (-NH2) and carboxyl group (-COOH). D-amino acid is a class of unnatural amino acids. It is a constituent of natural peptides produced primarily by microorganisms, using the non-ribosomal mechanism of synthesis. D-amino acid is a component of certain peptide antibiotics and is present in walls of certain microorganisms. D-amino acids are chiral form of L-amino acids. They are widely used in pharmaceutical synthesis (medicine and pesticides), food, animal feed, etc. The global D-amino acid market is expected to expand at a significant pace during the forecast period, driven by the increase in demand for D-amino acid in the pharmaceutical industry. The global D-amino acid market was valued at around US$ 150.0 Mn in 2017 and is anticipated to expand at a CAGR of more than 5.0% from 2018 to 2026. D-amino acid plays an important role in vital processes of the human body such as tissue growth, energy production, immune function, and nutrient absorption. D-tryptophan is used to produce serotonin that regulates mood, sleep, and human behavior. D-amino acid alleviates fatigue, improves athletic performance, and stimulates muscle recovery. It assists in preventing muscle breakdown and preserving lean body mass. D-amino acid also improves mood, boosts exercise performance, prevents muscle loss, and promotes weight loss. D-amino acid provides health benefits. Therefore, demand for D-amino acid is estimated to increase in the next few years. Rise in awareness about health concerns and changes in lifestyle trends are likely to boost the global D-amino acid market. D-amino acid is primarily used in the production of domestic & synthetic peptides and peptide-based drugs. These D-amino based peptides possess synthetizing characteristics and are used in the treatment of Alzheimer's disease and tumors. D-amino based peptides are also used in synthetic peptide anti-pain analgesics and synthetic peptide protease inhibitors in keratotomy. These acids enable early detection of the Alzheimer's disease. Thus, increase in production of peptides in pharmaceutical applications is projected to boost the demand for D-amino acid. D-amino acid is also employed in synthesis of nicotinamide acetylcholine receptors, calcium channels, sodium channels, anti-epilepsy drugs, and endorphin releasing drugs. High prevalence of chronic diseases and the need to diagnose and treat such diseases in anticipated to augment the demand for d-amino acids during the forecast period. Peptides containing D-amino acids are used as sweeteners in the food & beverages industry. D-amino acid is used in therapeutic agents for atopic dermatitis, skin moisturizers, and wrinkle formation inhibitors. It is also used as skin beautifying agent in the cosmetics industry. Asia Pacific is a major region of the d-global amino acid market, accounting for substantial share. China is a key producer and consumer of D-amino acid. Presence of large number of manufacturers and processors in the pharmaceutical industry is expected to drive the D-amino acid market in Asia Pacific. Rapid industrialization and expansion of pharmaceutical manufacturing and processing plants in China and Japan are projected to provide an impetus to the demand for D-amino acid in these countries. Demand for D-amino acids in the U.S. is projected to increase owing to the rise in research activities in D-amino acids and their production techniques. North America and Europe are the major hubs for the manufacture and processing of food and beverages. The D-amino acid market in Europe is estimated to expand at a moderate pace during the forecast period. Major players operating in the D-amino acid market include Evonik Industries AG, Tokyo Chemical Industry Co., Ltd., YONEYAMA YAKUHIN KOGYO CO., LTD, Central Drug House (P) Ltd., Zhangjiagang Huachang Pharmaceutical Co. Ltd., Sichuan Tongsheng Amino acid Co., Ltd, Sekisui Medical Co. Ltd, Kyowa Hakkon Kirin Co. Ltd, AnaSpec, Inc., and Varsal Chemicals. These players are focusing on reinforcing their D-amino acid product lines in order to increase their market share. This report focuses on study of D-amino acid at the global and regional levels. 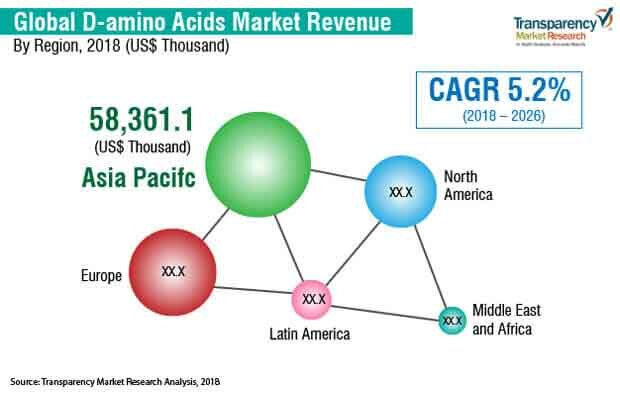 It analyzes and forecasts the market for D-amino acid based on revenue (US$ thousand) and volume (tons) from 2018 to 2026. The market has been forecast based on historical trends, and demand-supply scenario, drivers, restraints, opportunities, and expansions and developments by stakeholders across the value chain. The report incorporates detailed value chain analysis, which provides an inclusive view of the global D-amino acid market. Porter’s Five Forces model for the D-amino acid market has also been included to help understand the competition landscape of the market. The study encompasses market attractiveness analysis, wherein segments have been benchmarked based on their market size, growth rate, and attractiveness. The study provides a conclusive view of the global D-amino acid market by segmenting it in terms of product and end-use industry. These segments have been analyzed based on present and future trends. Regional segmentation includes the current and projected demand for D-amino acid in North America, Europe, Asia Pacific, Latin America, and Middle East & Africa. The report also covers individual product and end-use industry segments across all the regions. Key players operating in the D-amino acid market are Evonik Industries AG, Tokyo Chemical Industry Co., Ltd., YONEYAMA YAKUHIN KOGYO CO., LTD, Central Drug House (P) Ltd., Zhangjiagang Huachang Pharmaceutical Co. Ltd, Sichuan Tongsheng Amino Acid Co., Ltd, Sekisui Medical Co. Ltd, Kyowa Hakkon Kirin Co. Ltd, AnaSpec, Inc., and Varsal Chemicals. Market players have been profiled in terms of critical aspects such as company overview, business overview, financial overview, and strategic overview. The report offers the estimated size of the D-amino acid market for 2018 and the forecast for the next eight years. The size of the global market has been provided in terms of revenue and volume. Market numbers have been estimated based on product and end-use industry segments of the D-amino acid market. Market size and forecast for each major product and end-use industry segment have been provided in terms of the global, regional, and country-level markets.